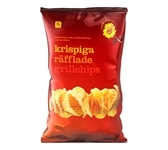 Axfood AB was formed in May 2000 through a merger between the Swedish grocery store chains Hemköp, D&D Dagligvaror, Spar Sverige, and Spar Inn Snabbgross. 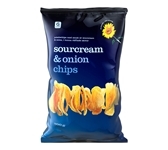 It is one of the largest food retailers in Scandinavia and is listed on the stock market. 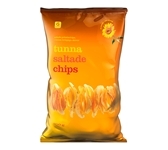 The Group’s retail operations are conducted through the wholly owned Willys, Hemköp and PrisXtra chains, which comprises 225 stores. 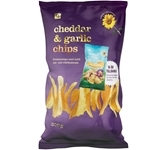 They also have deals with smller independents that increase the stores their products are sold in to over 800. 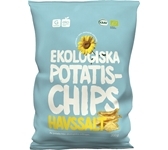 Axfood’s private labels consist of the Willys, Hemköp, Garant, Garant Ekologiska varor (organic products), Aware (Fairtrade), Eldorado (discount food brand), Func (batteries, light bulbs, etc.) and Fixa (kitchen supplies) labels. 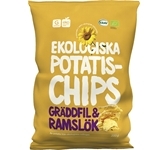 Below, you will find the Garant range of Potatis Chips, including Ekologiska.